Natural History in the -omics era « Nothing in Biology Makes Sense! Expeditions are planned to fill in gaps. The process begins with hours – many, many hours – spent poring over maps and satellite images, accounts of several hundred years worth of expeditionary research, and museum inventories. This allows us to direct our efforts to the mountain range or headwater creek most likely to yield new discoveries and important collections. In a given week, I spend more hours looking at Google Earth than I spend in class. Once we have selected an important area, the more tedious process of securing permits and obtaining funding begins. We forge or revive collaborations with researchers, institutions, and government agencies both in the US and abroad. When we finally have funding and permits in hand, the expedition can begin. Many of the sites we visit are extremely remote, and are not likely to see return visits by ornithologists in the near future. Because of this, and because getting to these sites is very expensive, we generally bring as many researchers into the field as possible for as long as possible, in order to maximize the expedition’s productivity. 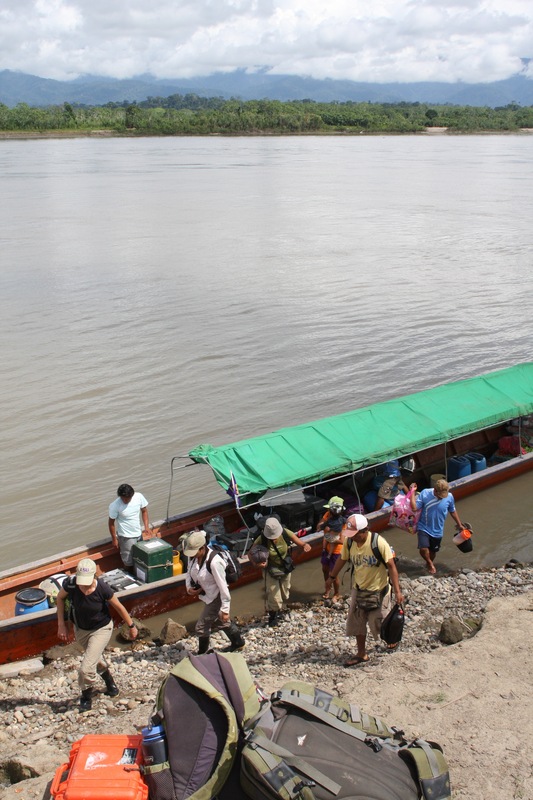 A team of between 5 and 15 graduate students and biologists from the US and abroad will spend anywhere from a few weeks to several months in the field, requiring a mountain of gear. Fortunately, the LSU Museum of Natural Science has, over the years, accrued enough tents, folding chairs, cookery, and chests to fill an REI.In addition to standard camping supplies, we bring along research supplies including mist nets to capture birds, materials to prepare specimens, and liquid nitrogen dewars for storing genetic samples. A major hurdle in any trip is simply convincing airline staff and airport security that they should let all of that stuff on a plane. But eventually, somehow, the research team is assembled in the nearest city to the expedition destination. In my case this might be Lima, Peru or Manaus, Brazil. After taking final steps to secure permits, and buying every type of dried food available in local stores, we embark into the field. In the Amazon Basin, this generally means setting off in a riverboat. Travel may take days to weeks. Along the way, we add team members – a cook from a frontier town, guides from indigenous villages, or porters to help carry gear. In some cases we have to travel on logging trucks for miles to reach upland forest away from the river’s influence, or hike up a ridge to reach cloud forest near the summit. 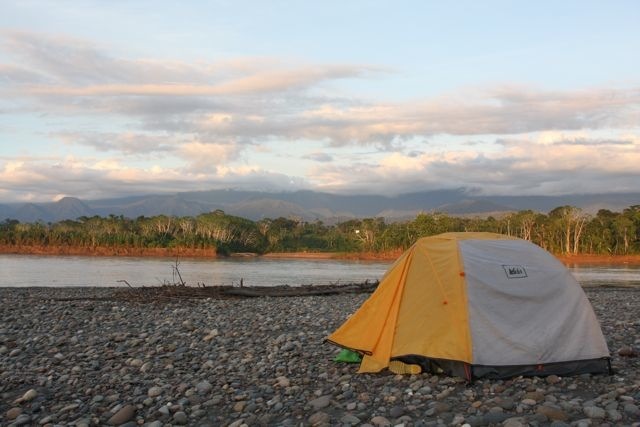 Finally, we reach our target destination and set up a field camp. Months or years from our first Google Earth view of a region, we are finally actually there, able to see in person what is there. We quickly settle into a routine in the field. Mist nets are opened at dawn, and the morning is spent traversing trails and streambeds in search of birds. We make audio recordings, collect birds caught in mist nets or with the aid of a shotgun, and keep track of the species and numbers observed. 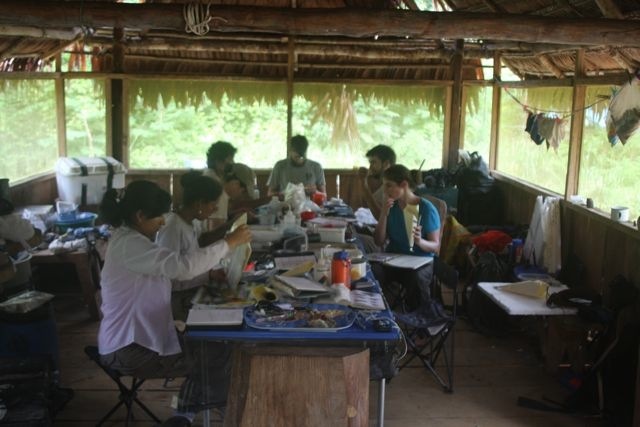 At midday, we close the mist nets and return to camp, and work until midnight or later preparing specimens. For each specimen, we record the colors of the eyes and bare parts, gonad dimensions (to predict breeding condition), skull ossification (which aids in determining the age of a bird), fat, and parasite load. We preserve the skin and plumage, tissue samples for genetic analysis, stomach contents, and any other material of interest. After a trip, all of this material is divided among the institutions and countries involved in the expedition, and deposited permanently in museum collections. Discoveries can occur at any time, either in the field or back at the museum much later, and the atmosphere around camp is often buzzing with the excitement that anything is possible. On a given morning, we might obtain the first genetic samples for a species with uncertain relationships, make the first audio recording of a previously unknown song, or find a species thousands of miles from where it is known to occur. There is a disconnect, however, between these discoveries and the time I spend in the field, and my research on comparative phylogeography. Comparative phylogeography is the study of geographic patterns of genetic variation across multiple species that have the same distributions. My work focuses on 40 species of Amazonian birds, and I try to relate their phylogeographic patterns to landscape history and ecology. For many biologists, field work directly generates the data used for a research project. Because I am studying many species across a much larger geographic area than I can sample myself, however, I rely almost entirely on existing genetic samples in museums, and I will end up using very few of the samples I collect on expeditions for my dissertation research. An additional disconnect between my field and lab work is that the skills I use in the field are entirely different from the skills I use for my dissertation research, which range from wet laboratory methods to computer programming. Learning two disparate skill sets, takes time, and the time I spend in the field is time I spend away from actively working on my dissertation. So why do field work? Why continue studying natural history if dose not directly benefit my research? This disconnect may not be unique to my area of research. As new technologies and methods become available, researchers must be proficient in an increasingly diverse set of skills, and must balance the benefits of specialization in one skillset with the broader perspective provided by a general approach. I believe there are two primary reasons that biologists must continue to do basic natural historical research. First, although my field work is very taxing physically, it is not as mentally challenging as writing or labwork. I find that while in the field, with my mind relatively free of dealing with the minutia of day-to-day research in the lab, I am more free to think about bigger questions. Observations I make in the field often inspire future research projects, and reignite the passion for birds that drove me to pursue this career path in the first place. Second, I feel it is vital to give back to the collections that I am using, even if the samples I generate won’t be used until some researcher needs them years in the future. Systematics, like many other fields in biology, is undergoing a revolution. The gradual shift away from natural history research has accelerated with the availability of “big data”. Fueled by new sequencing technologies, the –omics fields (genomics, transcriptomics, proteomics, etc.) promise to provide increasing amounts of data for use in comparative evolutionary studies. The rush to harness the power of new technologies and come to grips with the data they produce has perhaps drawn attention away from the natural history itself. Metanalyes and “supertrees” may give us the false impression that all of the samples and data required are already available. Although the current bottleneck is in curating and analyzing data, new computational tools are fast reducing the difficulty of this part of the process. Ultimately, the bottleneck limiting systematics research will shift back to products of natural history research, the availability of samples and the quality of the biological questions being addressed. This entry was posted in biodiversity, field work, genetics.